Thirty-four feet of continuous pickup provides high capacity haying. The new Oxbo 4334 self-propelled merger brings a new class of hay equipment to the market, being the first merger that moves on its own. The 4334 is 34 feet wide and allows the operator unparalleled visibility and flexibility in cleaning odd-shaped areas of a hay meadow. In addition, the 4334 allows the driver to stop the conveyor while the heads are still spinning. 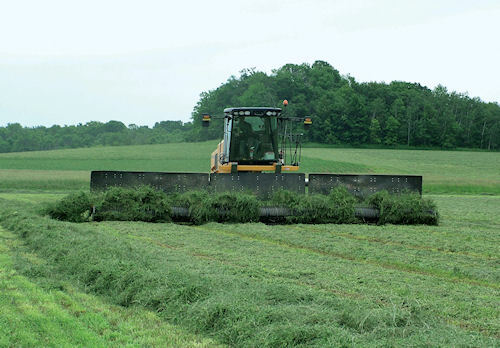 The front-mounted pickups allow haying without ever driving over the cut crop. Oxbo brings the 4334 to market as the latest in its long line of forage equipment that includes the Miller Pro Avalanche single and twin mergers to the continuous triple-head models. Oxbo's new 4334 self-propelled merger uses front-mounted pickup heads to keep tire tracks out of the hay and improve driver visibility of the operation. Operators of the 4334 use fingertip controls to provide on-the-go adjustments. A well-positioned joystick raises, lowers and folds the heads. Plus other easy-to-use controls are located nearby the operator's station. On the road, the new merger runs 30 miles per hour and heads fold to a 10-foot transport width in 20 seconds. Oxbo has field tested the unit and is releasing a limited number of 2012 production 4334s. More information is available at www.oxbocorp.com.